Dave & Inge Down Under: Our new House! 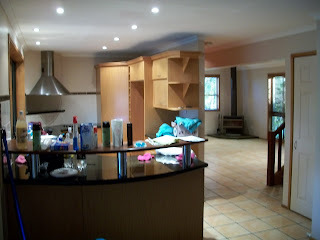 So on 12 Jan 2010 we got the keys to our new house. Its been quite a stressfull time as buying a house here is so different to Holland, everything is different and we were new to it all. No address of the house here on the blog as everyone has been informed and we dont want personal information on a blog that anyone can read. 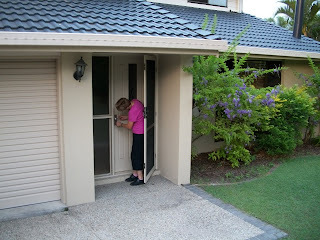 Here's Inge opening the door so we can start cleaning. A photo of the view from the kitchen. On the 2nd day we are still cleaning and wiping the walss ready to do some painting so some busy days ahead. Its nice to be in a house knowing its yours, we are glad to stop renting as its not the same as Holland..too much control by the owner and letting agent. Its 31C today so it was warm in the house even though nice breezes blow through the house. 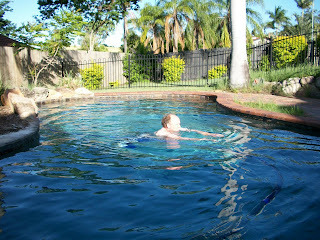 At the end of the days work I took a dip in our pool...beautiful, perfect temperature and a nice way of cooling off. Ziet er goed uit dat zwembad! Poets ze en veel plezier met de inrichting van de nieuwe stek! !